In a Deep Freeze? Weatherproof Your Home in 10 Easy Steps! This is a sponsored post written by me on behalf of Project Envolve. All opinions expressed in this post and blog are my own and may not reflect the opinion of Project Envolve and its sponsors. This post may contain affiliate links. I never heard the term polar vortex until a few weeks ago. If you live in the northeast or anywhere around the great lakes, you are probably very familiar with the term now as well. In layman’s terms a polar vortex is big cold front that moves down into the US from Canada, causing extremely low temperatures – so low that you might feel like you up and moved to Antarctica. Ok, so maybe I embellish a bit. But it is freeeeezing! Over the next few weeks, we’ll be getting hit with 3 cold fronts back to back, making this the perfect time to talk about ways to keep your house warmer. You can of course, pay a lot of money to get new windows (or ship all of your stuff to sunny Hawaii), but I’ll share some easy ways to keep the cold air outside where it belongs and stay toasty inside. So how can you weatherproof your home without breaking the bank? Let me count the ways! Replacing the weather stripping around all doors. It’s really easy, quick and cheap. 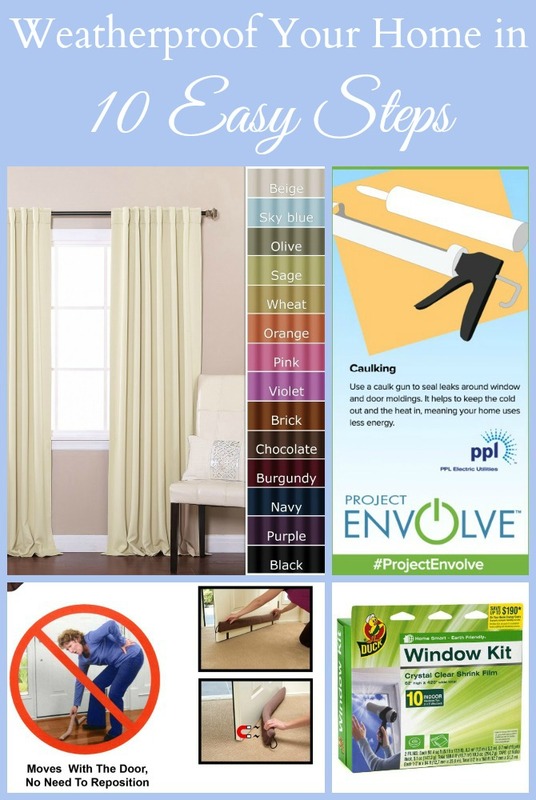 Use caulk to seal any cracks around windows, doors and baseboards. Use foam outlet sealers and outlet plugs (yep, like those needed to babyproof) to insulate and keep any cold air from within walls from entering the rooms. You can find very stylish thermal insulated blackout curtains on Amazon for about $45 a piece. Easy-to-install plastic window kits can help to increase the efficiency of your windows by 90%. And for less than $2 per window, that’s a great trade off. Most are easy to apply and clear so it won’t look tacky either. Use plastic or special attic covers to seal up entrances. You can get cheap reflective foil insulation for less than $10 or an attic pull down stair ladder cover for about $150. Use a draft dodger by all your exterior doors. You can buy one that moves with the door or simply roll up a towel. Turn your blinds up creating a tighter seal to help seal out cold air. Adjust ceiling fans so they move clockwise (when looking up at them) to push warmer air down. BONUS TIP: Don’t forget your basement. You can use plastic to cover the windows and add weatherstripping around the door to your basement to keep the cold air from creeping up. These tips work just as well for summer too, so if you do it now, you should see a decrease in your electric bill throughout the winter and summer! 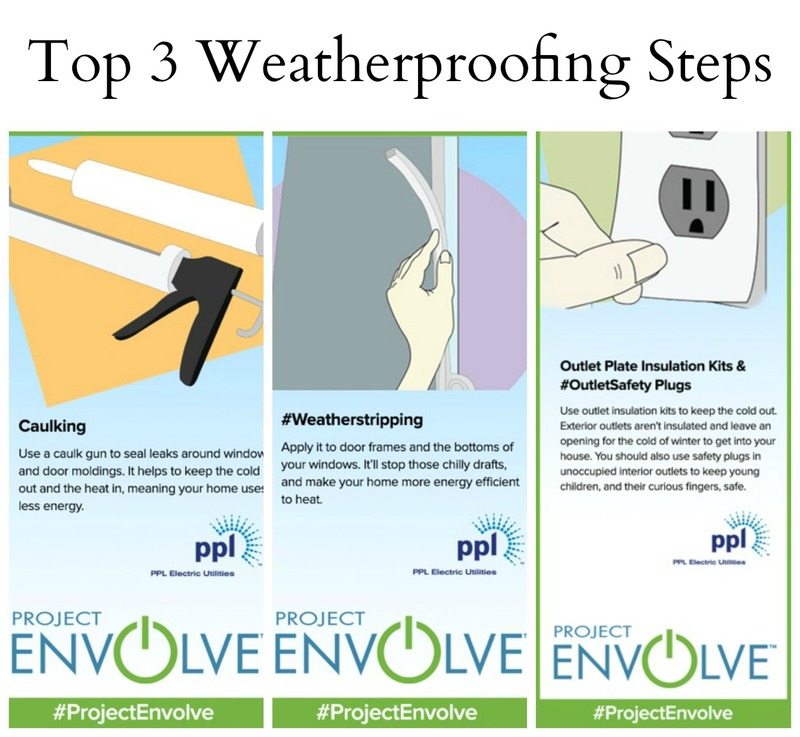 If you do nothing else this winter, the top 3 weatherproofing tips below will help to to eliminate the biggest heat suckers in your home! Happy caulking! 3 cold fronts still coming? Nooooo! So sick of winter! But I love all these ideas. They’re so easy to implement! We have hardwood floors. Guess we need to invest in some area rugs. Thanks. Thanks for these ideas! There are always new things to do to help keep the heating bill low! Great tips – we have hardwoods through most of our house. brrrr! We need weatherproofing tips more than ever this winter! Thanks for the suggestions. We definitely need to weather-proof our home better. Thanks for sharing these tips. Good weatherproofing advice. Need all the help we can get. These are great tips! We do this for summer and it helps reduce our air conditioning bill! Great tips, I have never thought of insulating my plugs, wow… very cool.. So glad I live in Florida! It’s too cold for me anywhere else!! These are great tips and I am going to check these items in my home!! I have some drafty window that I need to take care of. It’s been very noticeable these last couple of weeks. A long time ago, I covered my electrical outlet. I had forgotten what a good idea it is. I will have to go and take care of it! It is so cold and anything will help! Attic covers and door dodgers are totally what we need! Thanks for the tips. Great tips, this is good for keeping cold air inside too, we do not use the heater here in Florida. Plus I like this because it can keep bugs out too! I am going to have to put these tips to use! I’m DONE with this cold! The great thing is that a lot of these tips also apply to keeping your AC from escaping in the summer! Thanks for sharing! Those are great tips! I do need to weatherproof my house. I noticed a draft coming in through the front door and I know I lose heat that way. Have to talk to hubby about it. I’m going to turn all my blinds up now! I had no idea!